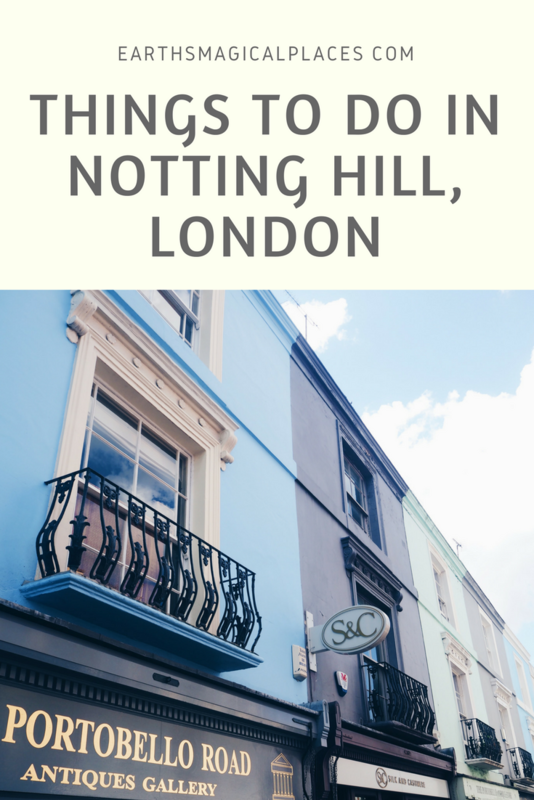 Before we delve into all the amazing things to see in Notting Hill, I’ll start my Notting Hill guide by explaining how best to reach the London Neighbourhood. Thankfully its very easy to do as the Central Line stops inches away from the main Notting Hill attractions at the Notting Hill Gate station. Another Notting Hill tube station worth using (if it’s easier to travel on either the Circle or Hammersmith lines) is Ladbroke Grove station which is only about a 10minute walk away from Notting Hills centre. 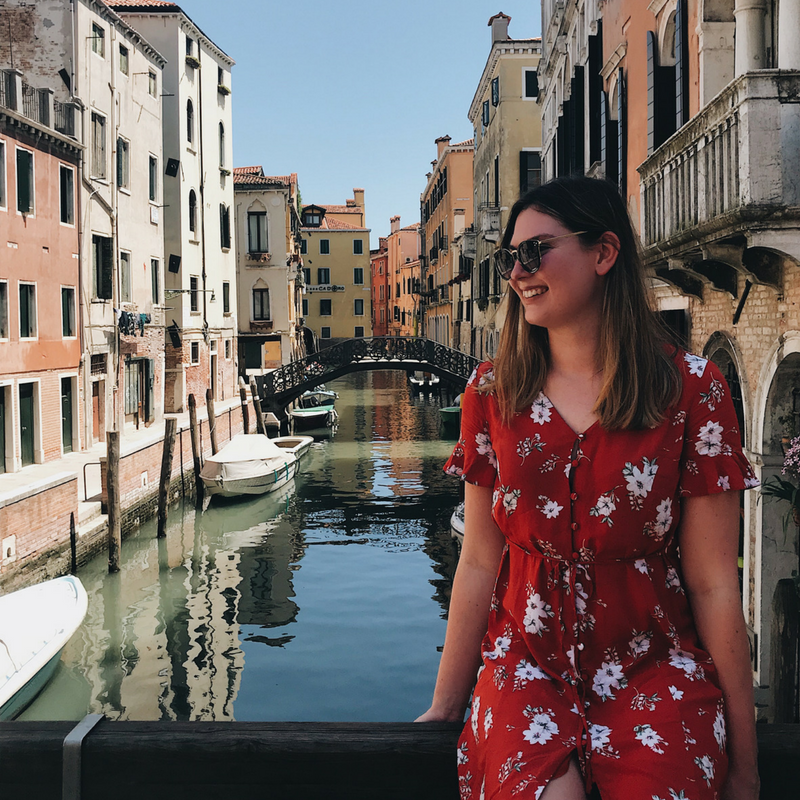 A Notting Hill guide wouldn’t be complete without suggestions of where to eat, and since I’d been exploring the nearby ‘Kensington Palace’ on the morning of my own visit to Notting Hill, I arrived in the area around midday with one thing on my mind – food! Thankfully I quickly learnt that the Notting hill food scene has a lot to offer! Westbourne Grove is home to some of the best restaurants in Notting Hill. I opted to have lunch at the 202 café on my own visit here which is linked to a boutique clothing store. This means you can eat and shop at the same time… and what’s better than that? Although a tad expensive, the food was to die for! 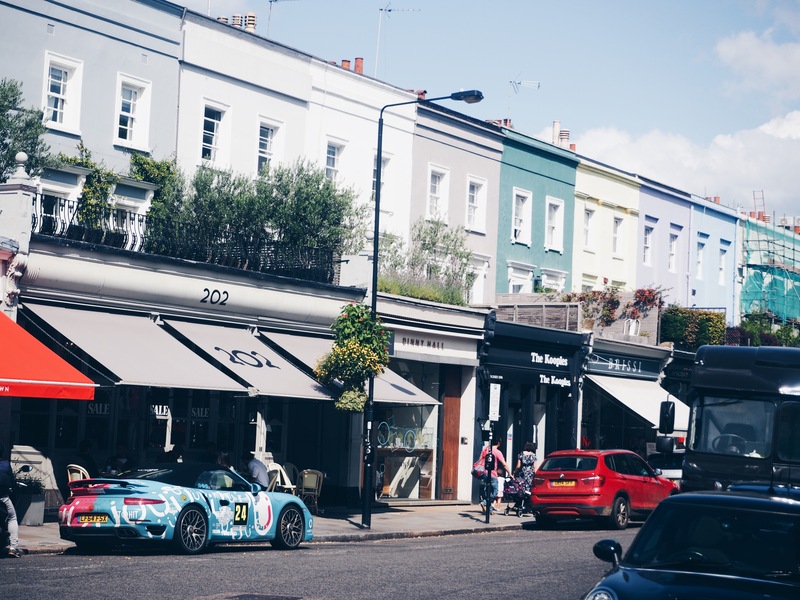 Out of all the things to do in Notting Hill, a trip to Portobello Market is top of everyone’s list… As I mentioned briefly above, every Saturday the bright and vibrant Portobello road comes alive with an antique’s market, which happens to be the biggest in the world. 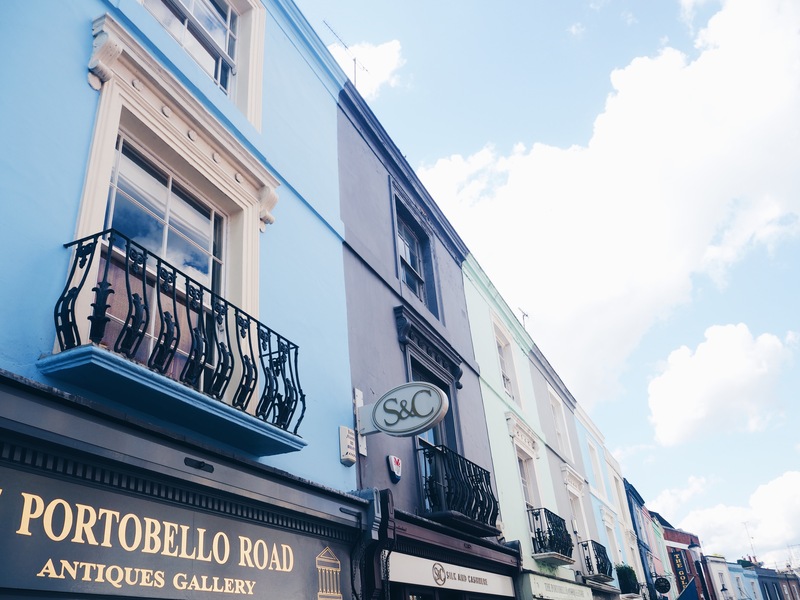 The so-called ‘Portobello Market’ is undoubtedly the most famous of Notting Hill attractions and is the perfect place to find one of a kind antiques and vintage clothes. A more unique suggestion of what to see in Notting Hill is the Electic Cinema, one of the oldest working cinemas in Britain. This provides the opportunity to watch the latest blockbuster films in unparalleled comfort. This is thanks to the cinemas vintage leather armchairs and footstools. There are even double beds available for couples! 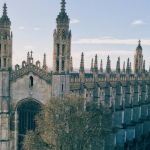 Bear in mind you’ll need to book online in advance and tickets start at £20 per person. 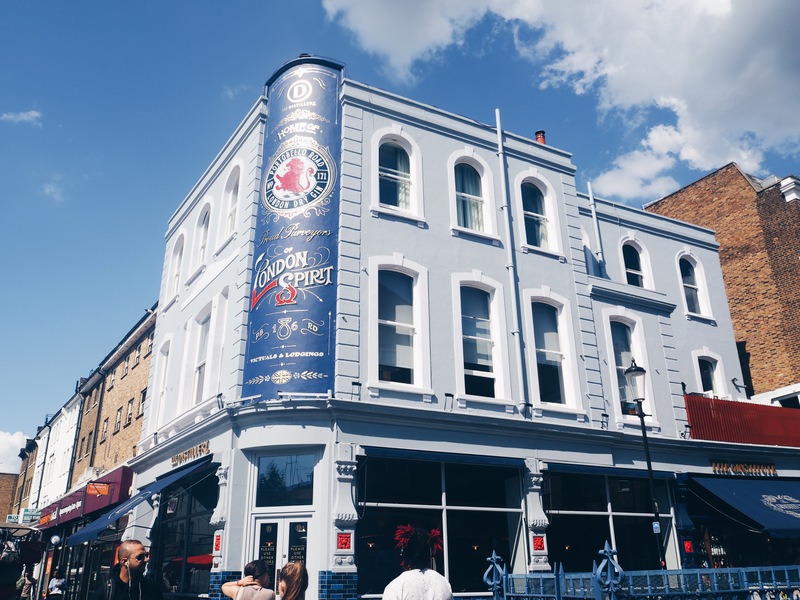 Slightly further up Portobello road, the famous street has even more to offer in the form of ‘The Distillery‘. In this way, I’d certainly suggest a visit to The Distillery to anyone asking me where to go in Notting Hill for a drink. 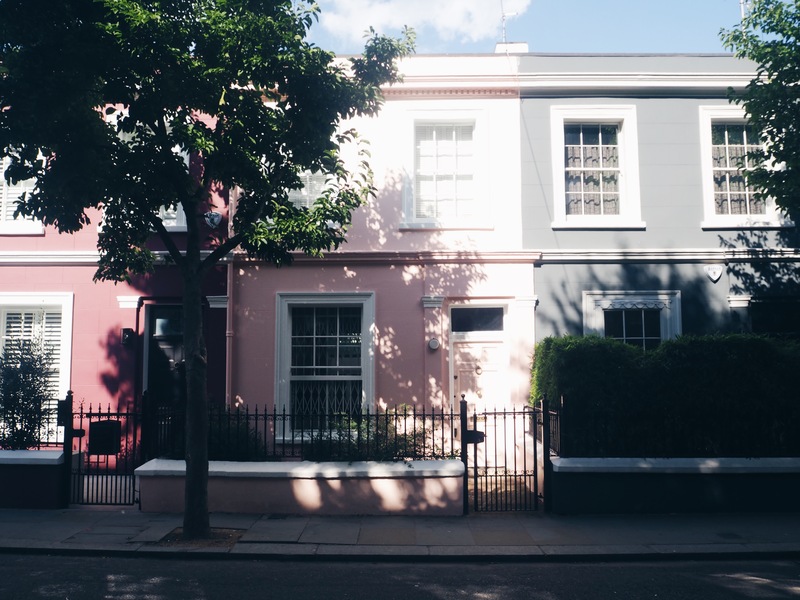 What I personally enjoyed the most about Notting Hill London, was its endless rows of colourful houses. The fabulous hues around every corner could brighten even the most overcast London day! 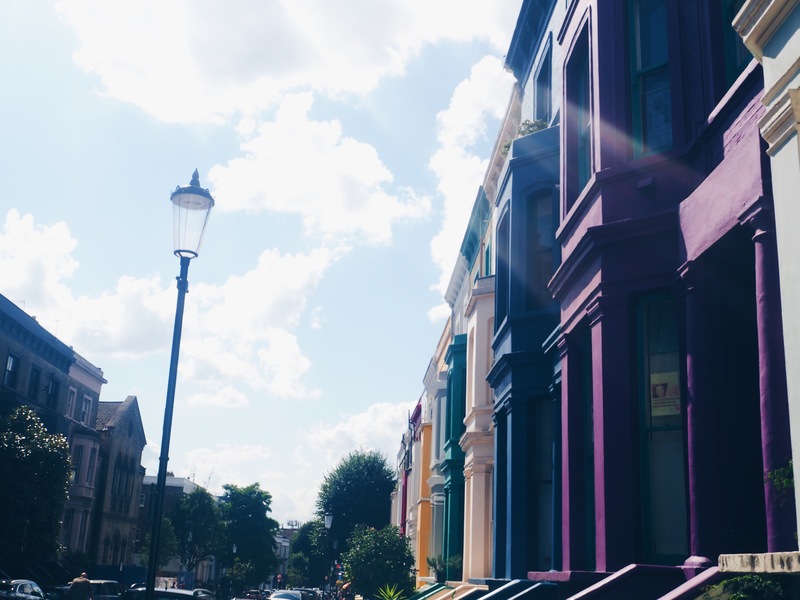 Highlights of what to see in Notting Hill include Lancaster Road (found at the top of Portobello Road) which features a rainbow of brightly coloured houses. Painted, red, purple and even green, these homes are certainly bold! However, my favourite street in Notting Hill is actually the less famous Denbigh Terrace which has a more subdued feel, as pretty pastels hold rank. If Lancaster road and the Denbigh terraces weren’t enough to make you envious of anyone living in Notting Hill London, another of my top places to see in Notting Hill are the areas labyrinth of hidden Mew’s. St Lukes Mews (near to Lancaster road) is certainly Instagram-worthy with its ivy-covered houses and white painted doors. Colville Mews also deserves an honourable mention in my Notting Hill guide, although I did not personally have time to explore what it has to offer. Exploring Notting Hill in summer can make you pretty hot! 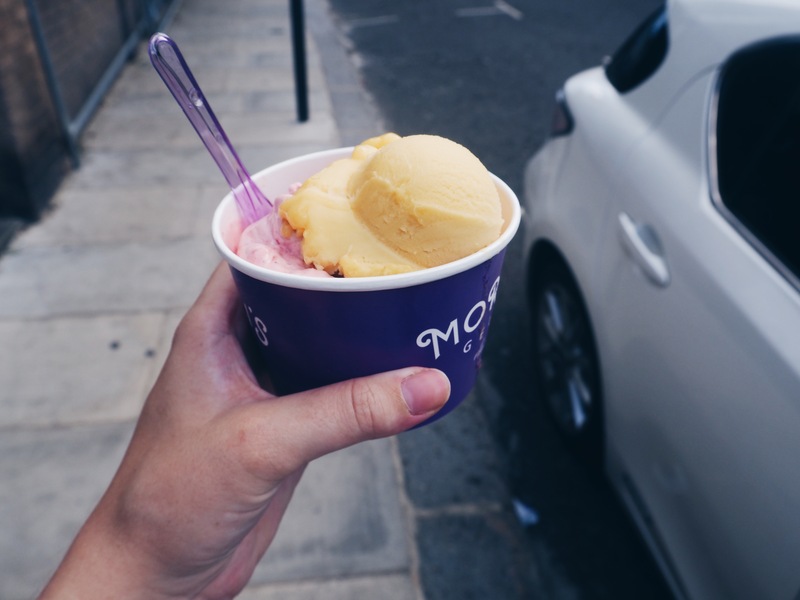 Therefore my final suggestion of what to do in Notting Hill is to grab some Gelato on Portobello Road, which has some of the best Gelato stores in the UK. 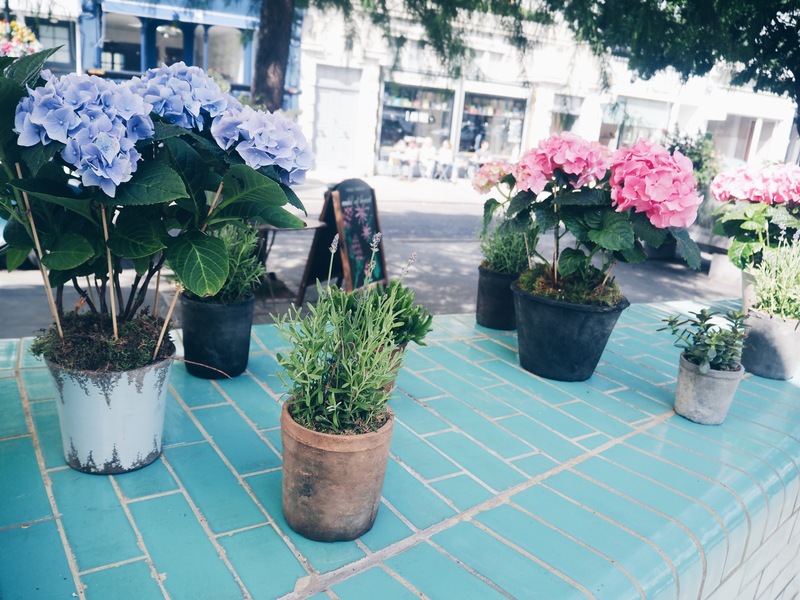 To summarise my Notting Hill guide, the area offers the perfect mix of everything I love about London: adorable cafes, beautiful streets and unique shopping experiences. 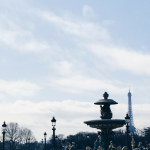 It also has a unique charm and vibrancy that can only be appreciated by visiting. I used to live in London and this definitely made me miss the city *sobbing*. I remember visiting Portobello market as well but what I don’t remember is that Notting Hill was so beautiful. I want to go back! Ahhh I can’t wait to go back to London! Although living in Notting Hill would most likely be a little out of my price range, a girl can still dream. I will definitely be saving this for my trip back! Oh my God, I have to here one day. I would be looking at the colorful houses all day long… And eating ice cream of course. You’re so lucky to live nearby! I haven’t been to the Carnival yet… But I am thinking of going with friends this year so am very excited, any tips? Seriously, the best intro to a post ever! Haha. Lancaster Road reminds me of The Painted Ladies in San Francisco. I’m sure when people buy those houses, they understand what a popular location they choose to live and just deal with the constant pictures. Hopefully visitors understand that they’re actual dwellings that people live in and act accordingly. There’s just no other way to start such a post haha. In all of my trips to London, I’ve never made it to Notting Hill. Ugh….such a regret. I really want to scour the Portobello Market for some treasures. Next time! 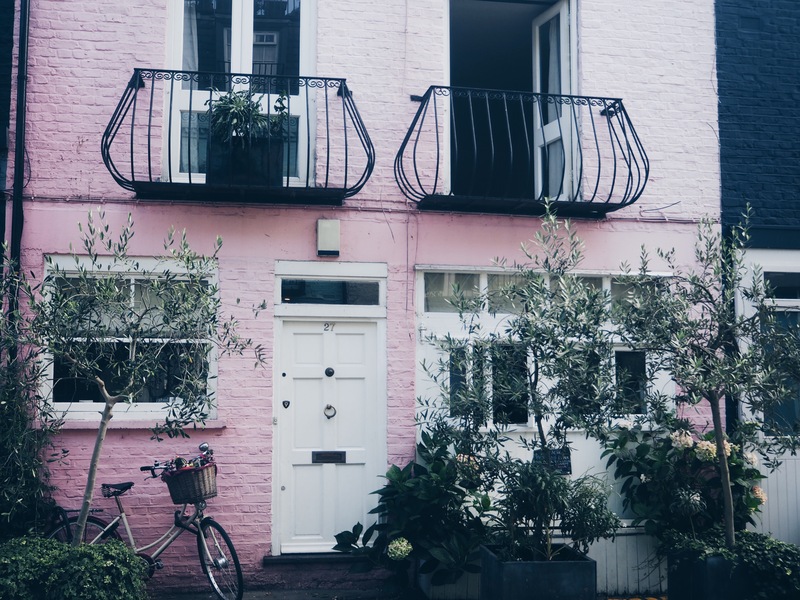 Notting Hill looks adorable!!! And that ice cream has won my heart haha! I wasn’t able to explore it during my last visit. Thanks for the great suggestions. I will definitely check it out during the next trip. This was a lovely read! I used to go to London a lot, but never went to Notting Hill. Feel like I’ve missed out reading your post. Oh well, off I must go! I used to live in London but unfortunately I didn’t get to explore Notting hill that much! Next time I go back I’ll need to go there hehe. Love all the photos!